Many parents are familiar with Google Docs, Google’s online word processing app. It’s become a staple of the workplace — easily shareable, great for collaboration, and with a fool-proof autosave feature. 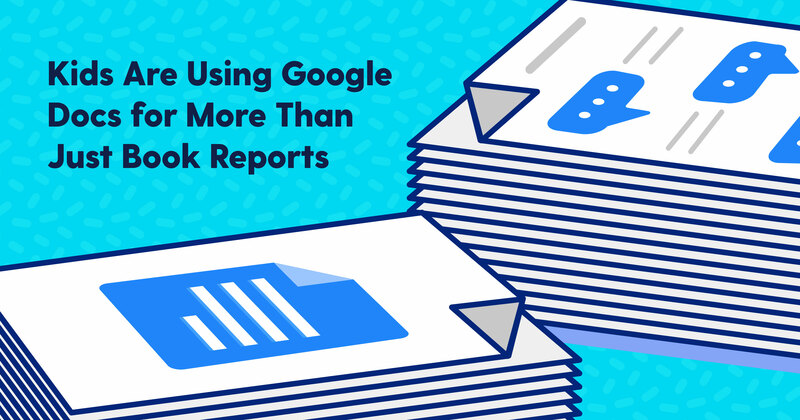 For these same reasons, Google Docs has also become popular in schools, with many children using it for schoolwork, homework assignments, and even group projects. But kids are incredibly inventive, and they’ve managed to turn Google Docs into a de facto communication and social media hub. Confused? We’ll break it down for you. When one person is typing in a Google Doc, it’s like a piece of paper. When you share it with a friend, however, it becomes one large text conversation. You can invite as many people to join the conversation as you want, and everyone can contribute in real time. How do kids tell who’s who? Little avatars in the corner show who else is viewing the document, with assigned profile colors that match that user’s cursor. Kids have turned to chatting in Google Docs in class out of necessity. Schools often block stand-alone chatrooms and social media platforms with a firewall, and students know that websites for school work can’t be blocked. Classroom chats in Google Docs can then pick up right where they left off when kids get home. While parents may think their child is deep into a history paper, they may actually just be chatting with friends. A few weeks ago, we discussed how rampant cyberbullying is with today’s kids, and how it’s different from the schoolyard bullying parents may remember. At Bark, we’ve seen more than 60,000 cases of kids ganging up on other children in Google Docs. They work in tandem to write mean or hurtful things in a shared Google Doc. In other cases, kids create private, digital “burn books” and invite others to contribute while leaving out the teased child. A blank Google Doc can also become more than just a chatroom. By adding images and embedding videos, kids can make it into a repository for jokes, memes, photos, and more. Kids can comment on images and text, and create jokes and stories filling page after page. Like Snapchat, kids can post images and then quickly delete them. Google Docs can be accessed on any device that connects to the internet. Many kids use it as a diary; a convenient one that can be pulled up anywhere and anytime, whether on their phone, tablet, school Chromebook, or home desktop. But unlike traditional pen-and-paper diaries, these new electronic journals are entirely private, leave no paper trail, and don’t have to be hidden under the bed. Kids often pour their hearts into Google Docs, keeping hidden the signs of depression or anxiety they don’t share on social media or in texts and emails. Whether your child uses Google Docs at school, at home, or both, Bark can help monitor what they’re getting into. Bark for Schools provides free monitoring for student-issued accounts for K-12 schools in the U.S. Ask your child’s school if they’re currently using Bark — if not, direct them to bark.us/schools to learn more. Bark for Families is $9 per month and monitors texts, emails, YouTube, and 24+ social media platforms. Sign up today for a free, one-week trial.